Special Containment Procedures: SCP-395 is to be kept in the center of a locked room at least 10 meters wide. No female personnel are to be allowed into SCP-395's room under any circumstances. The room is to be guarded by two male personnel at all times. Any unusual behavior should be reported immediately. Any independent movement on the part of SCP-395 should likewise be reported. SCP-395 is to be fed one liter of a half-and-half mixture of blood and milk, both taken from the same individual, once a week. Failing to follow a regular feeding schedule will cause SCP-395 to increase its range at a rate of 10 meters per day without food. If it has not been fed for more than one week past its expected time, it will begin to [REDACTED]. 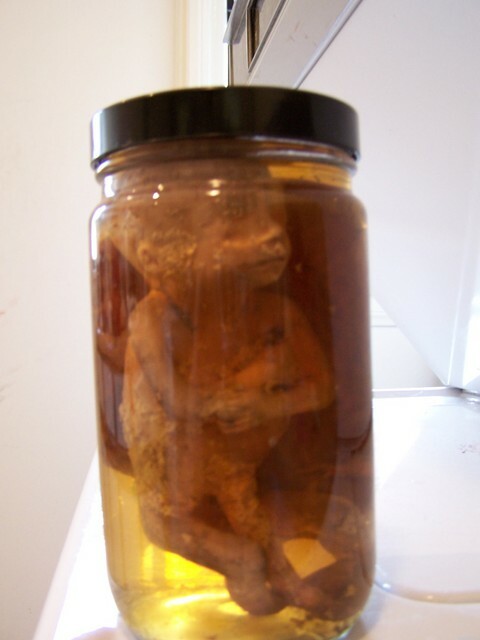 Description: SCP-395 is a human fetus, approximately 7 months into its development, contained in a specimen jar. The jar is filled with a standard formaldehyde solution, with traces of blood. When a female human comes within 5 meters of the jar, SCP-395 is able to telepathically influence her. At that point, the subject will feel a need to remove SCP-395 from its jar, and allow it to feed in the normal manner. All women, regardless of age or medical status, will lactate under this telepathic inducement. Once the milk has been exhausted, SCP-395 will continue to feed, drawing blood and gnawing flesh from the subject. The subject apparently feels satisfaction throughout this process, only understanding what has actually happened when SCP-395 is sated and releases its control. SCP-395 was taken from a traveling freak show, whose owner had been using it to control women for his own personal use. It was discovered when police tracked the bodies of his victims back to him. One of the arresting officers fell under SCP-395's control, and killed her partner when he attempted to stop her from removing it from its jar. Foundation agents caught the report from the follow up investigation, and acquired SCP-395. Interrogation of SCP-395's owner revealed little. He had acquired it along with the rest of the show from the previous owner's estate. Documentation included with the estate indicated that SCP-395 had been purchased from a teaching hospital in the early 1900s. No information regarding the parents was included. Testing by male personnel shows no detectable life signs while SCP-395 is inside the formaldehyde solution in its jar. Only when a female human subject comes within its range does it become active, exhibiting a faint heartbeat and high levels of brain activity.